FUN, FAMILY AND FRIENDS! JOIN THE PBS39 KIDS CHARACTERS AND WALK TO HELP HIV AWARENESS RIGHT HERE IN THE LEHIGH VALLEY! 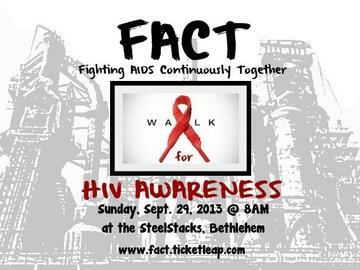 Join the 20th Annual FACT Walk for HIV Awareness on September 29th, 2013 as a sponsor, volunteer or walker. In the past fifteen years, the FACT Walk has risen over $430,500 and because we are staffed by volunteers, we can return 100% of each dollar to the community for services. Services such as HIV awareness/prevention and education, HIV-testing/screening, case management, as well as the most basic of needs such as heat, rent, medication, food and transportation. The walk will take place at the Artsquest Center at Steelstacks in Bethlehem. Sponsors include Artsquest, PBS39, Orasure, Lehigh Valley Health Network and St. Lukes University Health Network. BRING YOUR FURRY FRIENDS! and help support HIV Awareness! AWARDS FOR THE MOST MONEY RAISED BY HIGH SCHOOL, COLLEGE, CORPORATE AND INDIVIDUAL. 10:00 AM - Walk begins, friendly dogs are encouraged to participate! Team prizes will be annouced during our welcome ceremony. For more information on how to create a team, please visit FACT.